County Leitrim ( , Irish: Contae Liatroma) is a county in Ireland. It is in the province of Connacht and is part of the Border Region. It is named after the village of Leitrim. Founded in the early modern period, the county encompasses the historic Gaelic Ireland territory of West Bréifne corresponding to the northern part of the county, and Muintir Eolais or Conmaicne Réin, corresponding to the southern part. Leitrim County Council is the local authority for the county, which had a population of 31,972 according to the 2016 census. Leitrim is the 26th largest of the 32 counties by area and the smallest by population on the island. It is the smallest of Connacht’s 5 counties in both size and population. 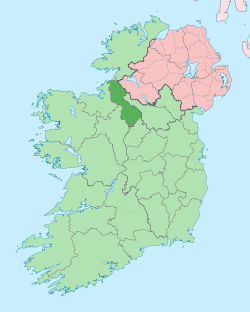 Leitrim is bordered by the counties of Donegal to the north, Fermanagh to the north-east, Cavan to the east, Longford to the south, Roscommon to the south-west and Sligo to the west. Fermanagh is in Northern Ireland while all the other neighbouring counties are within Ireland. There are five historic baronies in the county. While baronies continue to be officially defined units, they are no longer used for many administrative purposes. Their official status is illustrated by Placenames Orders made since 2003, where official Irish names of baronies are listed under "Administrative units". They are Carrigallen, Drumahaire, Leitrim, Mohill and Rosclogher. Lough Gill is to the northwest of Dromahair; Parke's Castle is located on the lake shore. Belhavel Lough is also located in Dromahair, within the parish of Killargue. Lough Scur, and Saint John's Lough, on the Shannon–Erne Waterway. Other lakes include Upper Lough MacNean, Glencar Lough, Glenade Lough, Garadice Lough, Rinn Lough, Lough Scannal, Lough Erril and Lough Machugh. In ancient times Leitrim formed the western half of the Kingdom of Breifne. This region was long influenced by the O'Rourke family of Dromahair, whose heraldic lion occupies the official county shield to this day. Close ties initially existed with the O'Reilly clan in the eastern half of the kingdom, however a split occurred in the 13th century and the kingdom was divided into East Breifne, now County Cavan, and West Breifne, now County Leitrim. The Normans invaded south Leitrim in the 13th century but were defeated at the Battle of Áth an Chip in 1270. Much of the county was confiscated from its owners in 1620 and given to Villiers and Hamilton. Their initial objective was to plant the county with English settlers. However, this proved unsuccessful. English Deputy Sir John Perrot had ordered the legal establishment of "Leitrim County" a half-century prior, in 1565. Perrott also demarcated the current county borders around 1583. Long ago Ireland was covered in Woodland, and five great forests are traditionally said to have stood in Leitrim, with a 19th century county survey stating- “a hundred years ago almost the whole country was one continued, undivided forest, so that from Drumshanbo to Drumkeeran, a distance of nine or ten miles, one could travel the whole way from tree to tree by branches". Many of these great forests were denuded for the making for Charcoal for Iron works around Slieve Anierin. Working of the county's rich deposits of iron ore began in the 15th century and continued until the mid 18th century. Coal mining became prominent in the 19th century to the east of Lough Allen at Slieve Anierin and also to the west in Arigna, on the Roscommon border. The last coal mine closed in July 1990 and there is now a visitor centre. Sandstone was also quarried in the Glenfarne region. Writing in 1791, the geographer Beaufort suggested the county housing population encompassed 10,026 homes with "upwards of 50,000 inhabitants", the primary agriculture being cattle production, and the growth of flax sustaining the linen industry. Leitrim was first hit by the recession caused by the mechanisation of linen weaving in the 1830s and its 155,000 residents (as of the 1841 census) were ravaged by the Great Famine and the population dropped to 112,000 by 1851. The population subsequently continued to decrease due to emigration. After many years, the wounds of such rapid population decline have finally started to heal. Agriculture improved over the last century. Leitrim now has the fastest growing population in Connacht. The Book of Fenagh is the most famous medieval manuscript originating here. In the 19th century the poet John McDonald (of Dromod) lived in the county, and William Butler Yeats spent the turn of the twentieth century fascinated with Lough Allen and much of Leitrim. Glencar Waterfall, 11 kilometres (7 mi) from Manorhamilton, inspired Yeats and is mentioned in his poem The Stolen Child. Leitrim has the fastest growing population of any county in Connacht. As measured by census, the population rose by 12.2% between 2002 and 2006 to 29,000. 2005 HEA statistics identified that Leitrim has the highest rate of participation in higher education in Ireland with 75% of 17- to 19-year-olds being admitted to a higher course. The county town is Carrick-on-Shannon (population 3,314). It is a highly developed, prospering river port on the River Shannon and many tourists hire cruising boats here to explore the Shannon and the Shannon-Erne Waterway -a 63 km canal linking the two river systems. It is amongst the fastest growing towns in Ireland having grown by 25% in the past few years. Leitrim County Council is the local authority for the administrative county. The county is divided into three local electoral areas for the purpose of elections: Ballinamore (6 councillors), Carrick-on-Shannon (6 councillors), and Manorhamilton (6 councillors). For elections to Dáil Éireann, Leitrim is in the Sligo–Leitrim constituency. This constituency existed from 1948 to 2007, but from 2007 until Sligo–Leitrim was re-created in 2016, County Leitrim was divided between two constituencies: Roscommon–South Leitrim and Sligo–North Leitrim. This proved controversial, and at the 2007 general election there was no TD elected whose domicile was in the county. Supplementing the local and regional road networks are the N15 (Sligo-Leitrim-Donegal), N16 (Sligo-Leitrim-Enniskillen) and N4 (Sligo-Leitrim-Dublin) national roads. Railway stations in Leitrim on the Dublin to Sligo line include Dromod and Carrick-on-Shannon. The Cavan and Leitrim Railway opened on 17 October 1887. It consisted of two branches, meeting at Ballinamore which connected Dromod and Arigna with Belturbet. Services carried goods, passengers and coal from around Lough Allen. Although protested, the line finally closed on 31 March 1959. Railway stations in Leitrim on the former Sligo, Leitrim and Northern Counties Railway (which ran between Sligo and Enniskillen) included Dromahair, Manorhamilton and Glenfarne. The Shannon and Shannon-Erne Waterway give access to much of Leitrim by boat. Pat Quinn - founder of Quinnsworth. Seán Mac Diarmada - Irish republican. Thomas Heazle Parke -explorer, naturalist. Patrick Rogan - US Army soldier and Medal of Honor recipient. James Gralton - Communist activist and only Irish person ever deported from independent Ireland.